Here are some best free anti malware software with VirusTotal file analysis feature. Using these free software, you can easily scan your PC for various malware, spyware. And these software let you scan for a suspicious file by using the VirusTotal file analysis feature. You can see the VT score and then you can decide what to do with the infected file or process. Sometimes you end up installing so many software and those software can leave secret spyware at certain locations on your PC. And your antivirus software may not be able to detect them. That’s where these free anti malware software come in handy. Day by day new viruses and malware are being discovered. If you want get latest updates about latest detected malware, then you can see it on some websites. Do note that these software are not an alternative to a good free good free antivirus software; these software just help you in getting a second opinion. 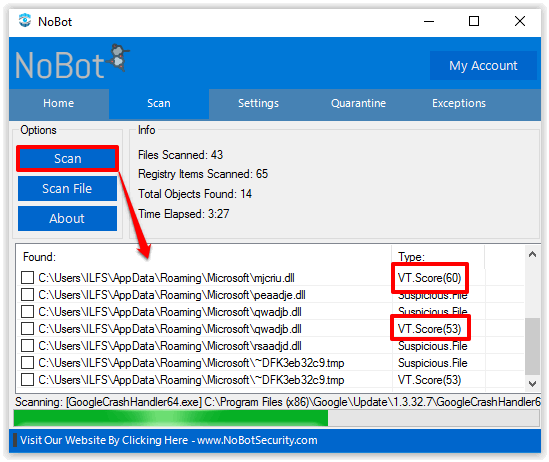 NoBot is one of the best free anti malware software with VirusTotal file analysis feature. The software is quite intelligent and scans you system registry, processes, and certain hidden locations of your PC. It scans files and if it thinks any file is suspicious, then it checks that file using VirusTotal. In the scan results it shows the VirusTotal score (passed ones) of the analyzed file. After getting the scan result, you can clean the threats that it finds. It’s pretty easy to get started with this free anti malware software. And you don’t have to install it first, as it comes as a portable software. Download it from the link above and install it on your PC. After that, launch it and you will see its interface which is very simple. You will find buttons on its interface to scan your system. Hit the scan button and it will start scanning. You can see the stats in the info section. And if it finds any suspicious file, then it checks that file by using its built-in file analysis feature. You can see the VT score in the scan result. See the above screenshot. SpyDLLRemover is an anti-spyware software that scans the DLLs of a running process and scans them if it thinks that they are infected. It uses VirusTotal file submission to check if a file is malicious and needs to be removed. Alternatively, it comes with a process explorer that you can use to monitor all the running processes and their corresponding DLLs. And you can individually check a DLL for infection by submitting it to the VirusTotal’s website. Using SpyDLLRemover is very easy. Just download and install it from the above link and then launch it. Use the scan button on its interface to start scanning the DLLs of the running processes. It organizes the scan result at the bottom of its interface. And after getting the result, you can either delete the DLL, scan it with VirusTotal, unload it from memory, and delete the actual file of which the DLL is part of. All these thing you can do using the right click menu of the software. See the above screenshot. Virus Total Scanner is quite a different software from all the above that I have mentioned. The software doesn’t support scanning feature, but you can use it to check a particular file. Virus Total Scanner calculates the hash of the file and fetches the virus total report on its interface. However, you will have to use it by specifying the path of a particular file every time you use it. 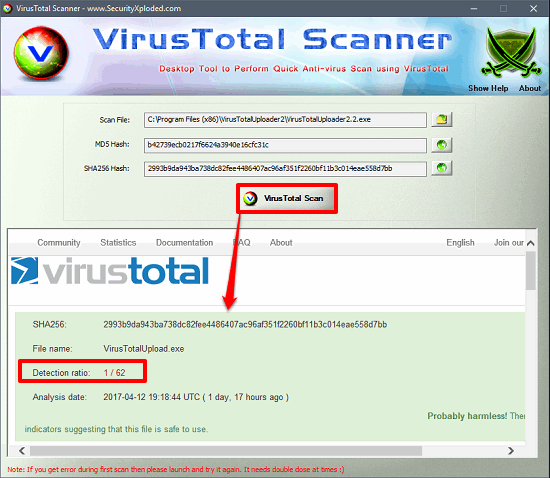 So, if you are pretty sure about a particular file on your PC that it is a threat, then you can check it using Virus Total Scanner. Also, the software can be very useful for scanning files that you have downloaded recently. Its fairly easy to use Virus Total Scanner to scan for spyware processes on your system. Grab its setup file from above link and then install it on your PC. To test any file for VirusTotal analysis, you can launch the software and provide the path of the file that you want to check. Alternatively, you can use the context menu option that it integrates in the Explorer’s shell. So, just right click on any file and then choose Virus Total Scanner option. And the software will calculate the hash of the file and bring you the VirusTotal analysis result in the lower pane of its interface. See the above screenshot. These were some pretty handy anti malware software with VirusTotal file analysis feature. All of these software support VirusTotal file analysis and give you accurate result. You can easily get details about any particular file or process by just a single click. Also, some of these software come with some other features as well, such as scanning the file with ThreatExpert or ProcessLibrary. And, you can use these software alongside your antivirus software.